My wife has an apple tree that she bought as a Russian Apple. I cannot find any info on it anywhere. The fruit is small and looks like a pear, however when cut it smells of apple. Below if a HTML tag of a photo of some of the apples. Does it taste like an apple or a pear? They look very much like "Nashi" pears. My wife says they taste like apples and are rather sweet. The "Nashti" pears I found on the net were single pears and much larger. These are half that size and grow in bunchs as seen in the photo. 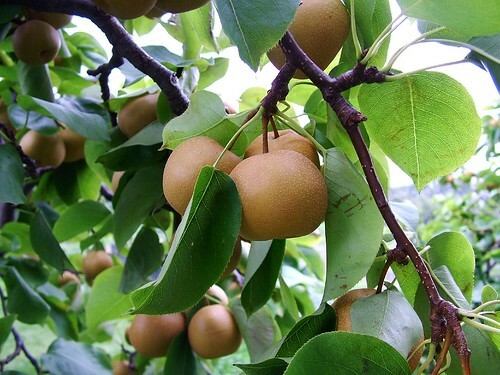 Asian pears frequently overproduce. If a person will thin the fruits out while they are still the size of a dime, the remaining fruit will get much larger. I am betting you have an asian pear. Not any sort of russian apple, unless you live in downtown Moscow and everybody else is calling it an apple! I hate it when trees are unintentionally mislabeled. Even worse when a seller says "Russian apple" and gives you no proper name. Snake oil comes to mind. Anything to get a sale. Hucksters. If you like asian pears, keep the tree! My wife says to tell you that she has 2 other Asian Pear Trees(the pears are as big as a fist) and that the leaves are completely different. She says that the leaves of the tree shown here are from an apple tree. The taste of the mini-fruit is "apple" and the smell is "apple". 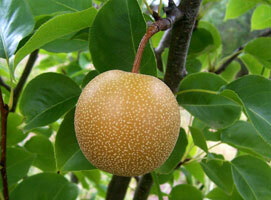 The fruit from the Asian Pear trees taste and smell completely different (like pear's). My wife says she bets you are wrong, but until we find out different we will not know. Thanks for the input. Still searching for the correct information. Well, from the picture you posted, it looked dead-on like an asian pear. If I am wrong, it would not be the first nor last time in life that I am wrong. Russet apples (brown apples) usually keep a long time. How is this brown fruit of yours for a keeper? Still got some around? Any chance you can take leaves and fruit in to an agriculture agency in your gov't white pages? That may help resolve just what it is she is growing. None still around. She made jelly out of the whole batch (tastes like apple to me). Will take more pictures of leaves this year and try to have gov't agency identify as you suggested. I'm thinking right along with plumfan. 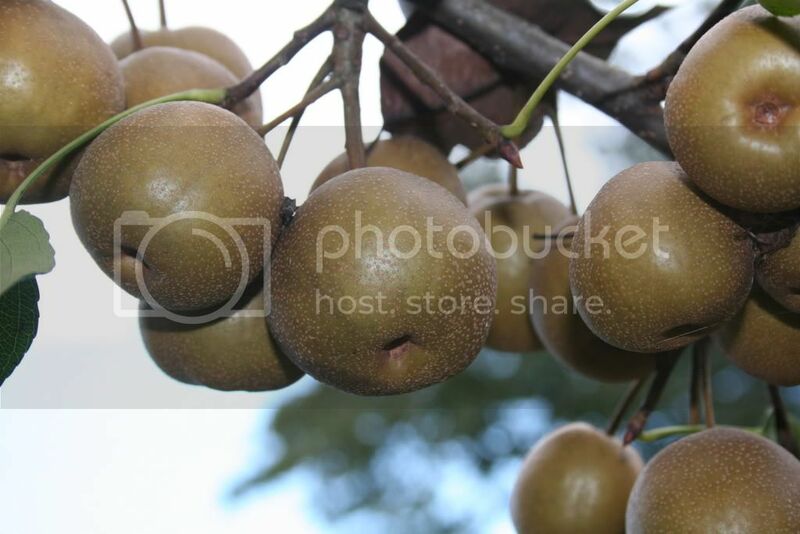 Looking at the apical bud, pronounced lenticels, shape and russeting on the fruit, I'd guess Hosui Asian pears. They will bear in clusters like this if not thinned. I grow 5 different varieties of Asian pears and they each have a different taste. Their taste also varies greatly from year to year depending on the growing season. I googled for Hosui Asian Pear, and these are the results. As our photo shows, the clusters are larger. 6-7 per cluster and the fruit is about 1/4 the size of the ones shown. They never get any larger. Will try thinning them this year and see what we come up with. My wife says the leaves of ours are rounder and look like her other apple leaves. Go figure. Thanks for the continued input. A solution will be found sooner or later. If you thinned the fruit of that tree to one-per-spur or one every foot of branch, you would see a large increase in size of fruit. My Mac apples get nice sized, but they bloom so friggin prolific, and set fruit so prolific, that if I don't thin them out heavily, they will all end up small, like a golf ball. When I thin them out at the size of a dime, they will go on to be nice, regular sized apples. Look up Callery Pear. I have maybe 20 plus trees on my property. I agree that they smell just like apples! I have been searching for the longest for apples, but it’s a pear.